Data Elite, a combination venture capital firm, accelerator and co-working provider that launched in October, has announced its first class of startups, all focused in some way on solving problems related to data analysis. The firm boasts a number of experienced advisers from major tech companies and venture capital firms, and has a high bar for acceptance: at least one founder must have five years of meaningful experience in the field or a previous successful exit as an entrepreneur. Covve: An innovative online application that reinvents the professional address book, it empowers contact owners and allows companies to extract business value from their informal contact network. It’s your contacts visualized. 451 Degrees ‘Graffiti’: Next-generation application delivery network that automatically optimizes content in real-time by analyzing user generated comments to enhance engagement, SEO, search traffic and online advertising sales. Unravel: An enterprise-grade operations and performance management platform. This technology enables automatic problem detection, rapid troubleshooting and mitigation, application acceleration, as well as smart resource allocation and capacity planning. O-RA (Pronounced: “Aura”): A data visualization platform that is creating a new form of the ‘digital self’ by mapping personal data — from social networks biometrics daily activities, etc. — into an aggregate, multi-dimensional, and prescriptive social identity. Sensai: The world is awash in unstructured information. At Sensai, we are building a Consensus Discovery Engine to provide insight to business users from that information. Sensai is a novel system that reads millions of pieces of content and instantly derives consensus of opinion on topics that analysts value. Pattern EQ: Aims to predict the future behavior of business by understating what drives the business and what impacts the revenue growth, forecasting how revenue streams will change and predicting customer behavior to boost overall customer retention. 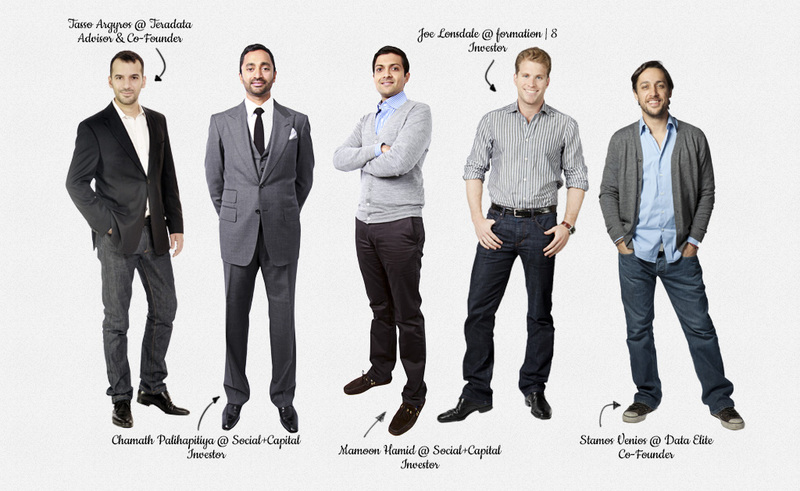 Data Elite’s founders and some of its investors. Unravel Data, a spinoff from the Starfish project at Duke University, seems particularly interesting. Originally designed as a system for managing multiple Hadoop jobs running on the same cluster, Data Elite co-founder Stamos Venios describes the commercial entity as an optimization engine for big data systems that can manage multiple environments (e.g., Hadoop and a data warehouse). Pattern EQ, which was founded by three Stanford Ph.Ds., is another company trying to rethink business analytics by finding correlations without requiring an analyst to ask the right question. Generally speaking, Venios said there was a trend toward bringing advanced data analysis tools to non-technical people, something that fits the description of Pattern EQ but also more-traditional BI startups such as DataRPM or ThoughtSpot. Ultimately, Data Elite hopes to have between 15 and 20 companies in its portfolio at any given time, Venios said. It’s currently raising funds for another round of investments, some of which might be follow-on series A investments in its existing companies. Every Data Elite company receives a minimum $150,000 in seed funding. Data Elite is also nixing its incubation phase and accepting new companies as they arise throughout the year. “We lost a couple of good deals because the timing didn’t work for these guys,” Venios acknowledged. Update: This post was updated at 10:47 a.m. with a new description of Sensai in the bulleted list.